This Chiang Mai half-day ride takes you on a memorable tour of the city’s most interesting sights. Go beyond the city walls to see temples, markets and an ancient city. Most visitors will never get to see these hidden angles, well off the beaten track. See Chiang Mai differently - meet and greet locals, stop when you want, find bike-only paths, and get a sense of the city between the highlights of our tour. Riders of all ages will enjoy our Chiang Mai half-day tour, which starts along the banks of the Ping River before exploring the city and some key sites. Visit elaborate temples, which serve as community centres as much as places of worship, and learn some important Buddhist principles and practices in Thai culture from your local guide. Chiang Mai guides take great pride in their northern culture and will be happy to share insights and insider tips with you. Take the smaller roads and discover hidden gems of the historical city as you ride off the beaten path. Head through shady quiet country lanes to pass beautiful traditional teak houses and say hello to the Thai men fishing in the river. Stop for a rest and to savor some seasonal tropical fruit and a cool drink under the shade of 100-year-old rain trees, before heading on to through the iconic city. No tour of a Thai city is complete without a trip to the local market. Get a chance to explore Thai culture through its many flavors as you peruse world-famous Somphet market with the trained eye of your guide, who will explain anything you want to know about the array of specialty Northern Thai food on offer. Meet at SpiceRoads office at 7.45 am where we are fitted for bikes and then we start our discovery of Chiang Mai city, or you can arrange pick-up and drop-off at additional cost. This tour will visit temples, which are considered a place of worship. Please wear a shirt with sleeves and shorts that cover the knees to show respect in these sacred places. Alternatively, you can bring a sarong to wrap around yourself during the temple visits. It was an excellent introduction to Chiang Mai. A great way to visit sites and gain some understanding of the way of life of the local people. We were very pleased with our tour guide, Dum. We have since booked another trip with SpiceRoads. A fantastic way to learn about the country, culture, and people up close and personal. Our guide was excellent - knowledgeable, patient, great English and always put safety first. Just the right balance of breaks vs. exploring. I felt very well looked after. 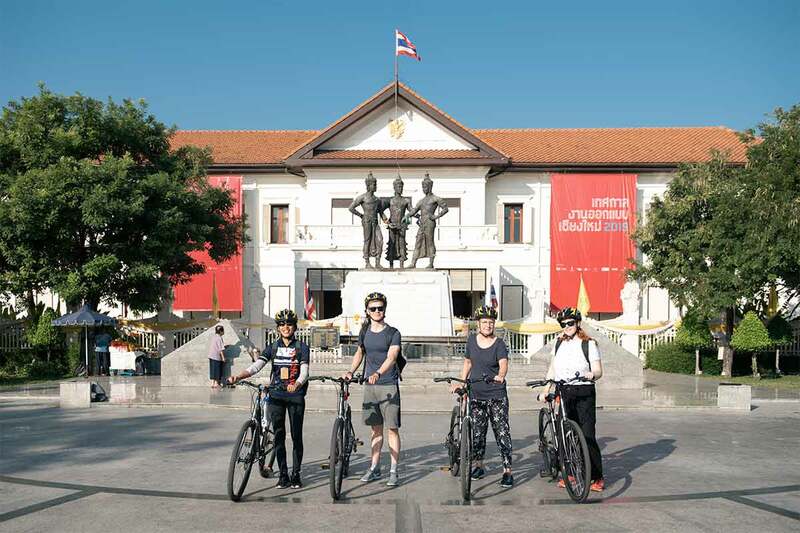 Suited for all riders, including families, our Chiang Mai half-day tour takes you on a memorable and informative tour of the city’s most interesting sights and beyond the city walls to see temples, markets and an ancient city. We’ll have a leisurely start along the banks of the Ping River, this tour will be an introduction to Thai culture and that can best be done by doing as the locals do and go to temples and markets, as your guide will explain the importance of Buddhism in Thai culture. Set in manicured, quiet grounds next to the river you can admire the colonial style white buildings that include a church and hospital. We pass beautiful traditional teak houses and can say hello to the Thai men fishing in the Ping River. We enter some spacious grassy parkland and stop for some fruit and a cool drink. And later explore the ancient city of Wiang Khum Kham which dates back to the 13th Century. Just excavated in the 1980s after being buried under mud from the river, we can visit an ancient temple which has a spirit house where a former king’s spirit is said to reside. We re-enter Chiang Mai's old city through Tha Pae Gate and stop at Somphet market have a look at the local fresh herbs that make northern Thai food so special, and this will be a great photo opportunity as well.